Just seven percent of respondents said that if they need to go downtown they would use the light rail. The syntax of the blurb suggests, at least to me, that only 7% of people in SE Seattle use light rail when they go downtown. That may or may not be the case, but that’s not what the question is asking. Wordplay aside, there’s a lot of information in this December 2009 survey on what the true barriers to higher ridership are, aside from the empty pits around most stations, for both bus and rail. Details after the jump. The survey boundary turns out to be I-5, I-90, Lake Washington, and approximately the Seattle city limit. These results suggest to me that stop reduction, bus priority treatments, and a richer web of connections would be more productive investments than more buses on existing routes or security improvements. getting those empty pits developed. There’s a lot more stuff about general perceptions, effective messaging, and so on in the survey. wouldnt a richer web of connections…whatever that mans really actually mean more potential stops? I think Martin means better and more diverse bus connections in this case. I would take the train between Rainier Valley and downtown more often if I could live in Rainier Valley. Unfortunately, all the affordable places I’d like to live are ones being opposed by the Seattle Displacement Coalition, so moving to affordable housing in Rainier Valley is not yet an option. I will vote against any city council candidate who opposes building up around light rail stations, even if they do also oppose the DBT. I’m not following you. It seems like you are saying there is zero affordable housing in the Rainier Valley. You aren’t actually saying that, are you? I meant around rail stations, where one can easily live without owning a car, not all of Rainier Valley. Sorry for any confusion. I don’t know what your price range is, but there are some really dumpy apartments just south of Mt. Baker. If you are willing to spend the time/effort there are some really good fixer upper deals on 23rd near the Beacon Hill station. Yeah that’s about as disingenuous an interpretation of the original text as I can imagine. The way it reads to me is that 7% of the respondents don’t need to go downtown at all, but if they did they’d probably take Link. …or a bus, which funnily enough 7% of the respondents said they would use if they wanted to go downtown. I think I’m actually a good example of the discrepancy. I go downtown maybe once a week and use Link to do so probably 95% of the time or more. Now, if you were to ask me “how would I use Link more?” the two things I’d say are “have it go more places” and “if I had a job downtown”. “Use Link to go downtown” and “would ride it more if I had to go there more” are not mutually exclusive. I wouldn’t use the word “disingenuous.” I seriously doubt PubliCola is trying to make ST look bad. I have the slides from the presentation and this number doesn’t come out at all, so it was either poorly, verbally explained or poorly understood by the reporter. Yeah, but it’s one of the few big words that I know how to spell. I’ve been waiting for months to find a suitable opportunity to use it. The original mistake was surely genuine, Martin, but the failure to update, correct, or revise the post is either disingenuous or cynical or arrogant—take your pick. Part of an unfortunate trend over there. This is how I interpreted it originally too, “I don’t need to go downtown, but if i did, I would use light rail”. 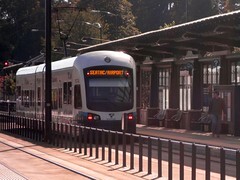 I live in North Seattle so I can’t take lightrail downtown. But as it stands now, I rarely find myself needing/wanting to go downtown. I go to Ballard, Fremont, Greenwood, Green Lake, etc for all my needs. This is one thing I’ve always hated about Seattle transit, it is soooo downtown focused. It’s more like American Airlines (or almost any airline for that matter) with its hub and spoke system and less like Southwest with a more point-to-point route plan. Hub and spoke may be easier to run for those running it, but it’s gonna take longer to get there for those using it. I’d pay more to go from Seattle to Kansas City directly over having to go through O’Hare. It’s great for commuting to downtown where there are obviously a lot of jobs or if your origination or destination involves downtown. If not, you do a lot of back-tracking. Okay. Now substitute the twelve and a half miles of I-90 from the International District Station bus ramps east to, where, Issaquah? Then ask what percentage of the residents of this area would use I-90 to get downtown. Imagine you’d done your survey a year and a half after the Lacey Morrow floating bridge opened. One suggestion: for the next year or two, pending opening of more ORCA outlets, let LINK tickets be good for transfers at least to ST Express buses, which are, after all, in the livery of the same agency. Better yet, if you don’t like paper transfers, let machines and outlets (in Vancouver, any convenience store does it) issue all-day passes every day good on everything. If any donut outlet made payment as hard as transit does, there’d be one more vacant storefront. Start putting the convenience of passengers ahead of the convenience of accountants, and a lot more people will ride LINK. And maybe a lot fewer will join the Tea Party. Well spoken. Revolt against the tyranny of the bean counters. Also, price what transit sells by the hour, not by the mile. Most everything transit keeps track of is by the hour (service hours per sub area, operating cost per hour, wages by the hour, hours between maintenance schedules, riders per hour). Yet, when the bean counters have there way, they charge by the mile(Link distance, Metro zones). Or we have a premium service charge based on the type of equipment (Link, Sounder, ST Express), but they all are used by the hour. If transit could just decide how many hours they want to sell you (2 hours min, all day pass, weekly, monthly, yearly), and decide on a unit price, then everyone can have the same price schedule. I don’t see any difference between riding Commuter Rail, or Link, or a bus for an hour, except one may provide a faster m.p.h. trip experience if you want to call that a premium service. Price them all the same! If CR is 4 times more expensive than a comparable bus ride, then transit should have the right to choose the appropriate equipment to serve a segment. That’s just common sense in business. Trucks to expensive? Ship Rail. That’s really hard to figure out. The “bean counters” give us numbers per revenue hour but it’s not broken down per route. We can take a guess based on ST express being $140 and Metro being ~$130 but the cost recovery (ridership) changes greatly not only per route but per time of day. You’d essentially kill all night service outside Seattle. Then you have to decide if you’re going to subsidize by percentage or absolute value. A street car that has 50% fare recovery is the same dollar amount per hour as a free bus. You’ll have a hard time selling Panache on a pay as you go system. If you just average everything out then you’ve got pretty much what we have now; you buy a two hour minimum transfer every time you get on a bus. What’s so hard about pricing all transit at say ‘2 bucks for 2 hours’. Go anywhere, on anything, owned by anybody, transfer till it hurts, whatever. You’re trying to make this more difficult than it has to be with route performance. No two routes or modes will be identical in costs. That’s just the nature of things. Decisions on basic services and coverage will trump true efficiency anyway, so why sweat it. Like Mark says, keep it simple if you want a bunch of customers. Personally, I’d rather see a more granular fare structure based on distance. I live near 4 fairly frequent routes, but don’t ride them often for daily trips because I don’t want to pay $2.25+ for a 1 mile ride. It makes more sense to just walk, even though it takes several times longer. Of course this would require the buses to be much more location aware so that charges could be handled automatically on ORCA. For cash-fares… probably have to stick with something like we have now, though I’d get rid of paper transfers. I would use LINK if it stopped as close to my door as the 168. In fact, I challenge the time table and direction in which LINK is expanding. I would first complete a line to Renton — leaving the more difficult I-90/Bellevue expansion for much later. Then I would run a line from Renton right down Benson Road all the way to Kent-Kangley. This would showcase LINK in two ways – long range to the workplace centers and local, as that route is highly trafficked by local workers and shoppers all day long. Other than the overkill by using Link for this route, it isn’t a half-baked idea. A RapidRide (or better, BRT) line up Benson Rd to Renton, and on up to RBS would connect two ethnically diverse corridors. Besides, there is more TOD potential up on the hill than down along all the valley freeways in the *flood plain*. “Highly trafficked” is really relative. Compared to downtown Bellevue? I don’t think so. 1) The most pedestrians seem to be at 104th/248th, secondarily Central Ave?, and Kent Station third. They should either make Kent Station a true center with a supermarket and other ped destinations, or make 104th/248th into more of a transit center. 2) 104th/Benson is low-density commercial+residential, with a few supermarkets interspersed with strip malls all in a 1970s style, and single-family houses in a 1950 style. I can’t remember if there were apartment buildings, but I didn’t see any townhouses. 3) The half-hourly 169 filled the one-section bus (no double seat empty). Doubling the frequency would increase ridership but would leave some empty seats at first. Of course, I don’t know how full the bus gets weekdays or evenings. 4) The bus makes two detours which add to travel time: Canyon Dr (Kent-Meridian HS) and Talbot Rd (Valley Medical Center). Do these serve enough Kent-Renton passengers to justify the detours, or would it be better to have separate routes to those areas (Renton-VMC shuttle, and Kent-school-elsewhere). 5) The South Renton P&R has an adjacent Uwajimaya and other things. Some ppl have suggested the regional routes abandon it, but now I’m not so sure. Although the 101 should go to Renton TC first. 6) Coming back on the 101, several ppl got on/off at the stops on Sunset/MLK (each one is an isolated apartment building). I’d never seen people use those stops before. If the 101 is truncated at Rainier Beach, it would be funny to have three routes from there to Renton (101, 106, 107). But on the other hand, the ppl in those apartment buildings can’t walk over the huge hill to the other routes, so I wouldn’t want them to lose bus service completely. 7) The 168 runs hourly. I don’t know whether that means it’s less dense/more residential than 104th, or if Metro is just shortchanging it. That’ll be interesting to see. The natural thing to do seems to be to extend the 168 and 169 west to Link (SeaTac or future 240th), and to make the 169 BRT. Maybe the East Hill detour should be straightened out to do less turns/backtracking; I don’t know. Having a Kangley – Kent – Benson – Renton – Rainier Beach route is intriguing, but my first question is, do that many people in Covington really want to go to Benson and Renton, or are most of them going to downtown Kent and the regional line (Sounder, Link, 150)? If they’re going north, would they really want to go on a route that goes to Kent Station and then backtracks to East Hill and then goes north, which would be a 10-15 minute detour? Or should 104th be made into a transit center, and have a route from Covington to 104th to Renton, bypassing downtown Kent. Would that be used? What a detailed set of thoughts. I’d love to read what John Bailo thinks of them. If I recall correctly, there was some political folderol between the city of Renton and Sound Transit when Link was still in its planning stages, which is why there’s a Tukwila stop and not a Renton stop. I’m not sure if there would be continued folderol if there were a push to extend Link to Renton/Kent, but the area could surely use some better connections to downtown Seattle. You’re all right if you want to go between Renton and Kent, or to Bellevue and Redmond, but if you want to go downtown it’s either the 101 or the Sounder, both of which have their own issues. The South Renton P&R is also, despite how it looks, pretty much in the middle of one of Renton’s employment centers. There’s some office towers and the Renton Village shopping center to one side, City Hall (which includes the police station) about three blocks away, and another shopping district and office park bordering it on the other side. Having the regional routes skip it would be a difficulty for a lot of folks who use transit to commute in to that area of Renton. I’d be totally in favor of BRT from the Benson corridor that met up with Link somewhere. Right now, to get from Valley Medical Center to the closest Link station, it’s 169 -> 140 -> Link. That’s the sort of trip that can easily turn into a two-hour odyssey to complete. What if the 101 were shifted so as to give up its northern path in favor of a one-seat right down Benson Rd, terminating at or near RBS on the north end? Three things will help residents use LINK more in the Rainier Valley: #1, better connections to the stations via bus, bike or walking. This is improving. #2, the city council to allow more TOD near the stations. This is also improving. #3, a Graham/Orcas Street Station. Why is there no station between these intersections? Dumbest thing ST didn’t do. Regardless of these 3 issues, ridership will grow in this corridor as it did in Vancouver’s original 15 mile SkyTrain line and Portland’s original 15 mile MAX line. It’s just a matter of time that people get used to the line and find ways of getting there (via bus, bike or foot). I’m almost a mile from ether the Columbia City or Mount Baker Stations and I have found the best walking routes from my house. Granted I am a runner and don’t mind the healthy walk and I can get to the stations in less than 15 minutes, but I see my neighbors (who are not exactly athletic people), making the trek as well. Ridership will also increase over the years as people who want to ride the train move closer to the stations, and people who don’t move away from them. Already happening. Had a conversation month before last in the middle of a football crowd leaving Beacon Hill station with a passenger who told me he’d just bought his condominium on Beacon Hill precisely because of LINK. I’m a fan of light rail but I hardly use it anymore, particularly if I want to go downtown. If I take into account parking fees at my nearest station (Mt. Baker) and round trip fares, it’s generally the same price for me to drive downtown and park in a garage. If I travel in a group, taking a car is much more cost effective than paying multiple fares. Plus, driving takes me about the same amount of time (or less) and offers the flexibility to go somewhere else other than simply returning along the light rail corridor. If I make any bulky purchases downtown, it’s also easier to transport them home in a personal vehicle rather than on lug them through stations and onto light rail. I only find light rail useful, convenient and cost-effective for airport trips or downtown trips on busy days (holiday shopping, game days) when downtown is gridlocked or for special occasion. I’m even less inclined to walk or take the bus to light rail and then ride to downtown because the trip would take much longer than simply driving downtown. A lot of my neighbors have this view on light rail as well – it’s nice for an occasional trip to a stadium or holiday shopping, but not as convenient or time- or cost-effective as a personal vehicle. Out of curiosity, how far are you from the station? And if I may add to that question, what’s the elevation change like between your home and the station? I am a 17 minute walk from the nearest station with mostly flat topography. So that’s about a mile then? Approximately a mile. But in the time that I walked that 17 minute mile, I could already be downtown in my car. There will always be people who will drive unless transit is significantly cheaper or faster for that particular trip. And as Scott said, certain occasions make driving such a hassle that it tips the scale in Link’s favor even to places he normally drives. Some people find that same situation on the Lake Washington bridges. They (especially 520 in the daytime, or I-90 in the reverse commute) are so backed up that it’s less frustrating to take transit even if you’d normally drive when they’re clear. On the other hand, there are also people who, if transit and driving cost about the same and take the same time, favor transit. The longer that Link is around, the more likely that more people will start doing this. Also, we haven’t talked about the looming oil price increases in the next few years (if not this summer), which will shrink the circle of destinations where driving alone is cost-equivalent. Sounds pretty typical – most people (and hence the planning models) use 1/2 mile, or about 10 min. walk, as the cut-off for their decision making. The other statistic cited in the Publicola link — “nearly 40 percent of those surveyed thought the walk to the nearest light rail station was ‘difficult or somewhat difficult’ — would seem to back you up on this. A station here would be the wiset $10m that ST has ever spent. Is anyone from ST listening? Where does your $10 million figure come from? Just a guess because that’s what the Stadium Station cost when they decided to add it. I’m sure it would be more since MLK would have to be widened here. Still, it would be a good investment and pick up many more riders. I believe ST did some analysis on the initially-proposed Graham Station and found that it cannibalized much of its ridership from Mount Baker and Othello stations. That situation may not hold over time, as Mount Baker and Othello get more TOD, and assuming some station-area planning around Graham to accommodate some higher density zoning. And no way a retrofit surface station at Graham costs $10m. Tracks wouldn’t move, and side platforms could copy the SODO Station design. A major cost would be property on each side, because MLK traffic lanes would have to be pushed 15 feet or so on each side, to make room for platforms. Graham at least deserves a proper feasability survey. What ST predicted before construction when Link was just on paper is different from what people might do now. People are consistently saying they aren’t taking Link because it’s too far from Graham (and also from the areas east and west of Graham). So they aren’t cannibalizers. The only people who might change are those who live exactly halfway between Graham and the next station, and why does it matter which station they choose? You can tailor a single-station study to proclaim whatever you want it to. But you can’t refute the accrued knowledge from a planet full of rapid transit systems, which is unequivocal that 1.75-mile station intervals put most people out of their walkshed. When I did a survey of stop spacing, speed and ridership in North American rail systems, I found that slower systems with shorter stop spacing (0.5 mile) generally had the highest ridership (Caveat: the station areas also need to have high density). I am now researching Asian urban rail systems, and finding that 1 km stop spacing is almost universal. But these systems are not 60 miles (100km) long. If we add a Graham Street stop, or other infill stops, we need to understand that Central Link will not be useful transportation from Federal Way to the UW, or Lynnwood to the airport. Central Link would be useful for trips up to 15 miles. Other transit modes, i.e. mainline rail, should be used for longer distances. I generally agree with your distillation of the data, though it’s important to note that adding a well-advised stop or two ≠ shrinking to a 0.6-mile spacing. The former would add, at most, 30-45 seconds per stop, times a handful of stops, which is obviously a worthwhile trade-off for vastly improving the usefulness and the pedestrian reach of the system. You point is well-taken, though I’d put the number at 18 or 19 miles. For a Roosevelt-to-airport trip, no train will ever compete with traffic-free driving. But even with an added stop or two, Link is infinitely better than any other option. Ditto for, say, Des Moines-to-downtown. Is it BART’s fault that the East Bay is so automobile-oriented that there’s only so much you can do? If you double or triple the number of stops, that may help short-distance mobility, but it would make SF-to-Fremont or Berkely-to-Fremont take even longer than the 60 minutes it already takes, with even more impact on those whose ultimate destination is San Jose. To me it’s ludicrous that the Bay Area does not have full-time trunk trains between SF, SJ, and Oakland at 60 minutes max. Maybe that’s impossible with BART because it’s already 60 minutes by the time you reach Fremont, but they should at least try to make it something reasonable, otherwise people drive because “transit takes too much time”. Caltrain has too many stops so it takes 1 1/2 hours (except the baby bullets, which are only at rush hour), but Caltrain itself runs only hourly off-peak and two-hourly Sundays and stops at 10:30pm, so there’s no way to go to SF for a late evening show and come back when it’s over. New York doesn’t say, “We don’t have express trains” or “Our trains end at 10:30pm”, and that’s why a lot more people take transit in greater NYC and Long Island, while in the Bay Area they drive. A couple well-chosen infill stops like Graham would be a significant enhancement for little cost. Federal Way and Tacoma are already lost: it seems impossible for Link to compete with ST Express there. It’s all a matter of scale: all lines of differing speeds and stops serve a primary market well and a secondary market marginally. The answer is not to build one line and ignore the other market; it’s to have multiple services at multiple speeds. The reason Federal Way needs express service to Seattle is that that’s where most of the transfers are. Mainline rail and express buses could be a solution but they usually fall down on frequency. NY PATH and LIRR are the only commuter rail systems I’ve seen that run frequently around the clock. That enables you to go somewhere and get back in six hours (half a day or an evening). If the transit is available, people will use it. If it’s not available, they’ll drive or not go at all. I suppose the BART comparison is imperfect, since even the lines to Pleasanton and Bay Point offer some value in that they provide an alternative to all-day highway bottlenecks. And yet those outer-branch lines were ridiculously expensive to build, and their few thousand riders are so heavily subsidized today, and the limited functionality of BART even in the urbanized inner Bay communities that makes only a fraction of trips remotely feasible, that the system’s long testicles can’t help but seem a waste. Especially since service usefulness/frequency in the core Berkeley/Oakland/SF segments suffers as a result. And they should be. They don’t even have all-hour bottlenecks to quasi-justify the expense of construction. Federal Way folk only take medium-to-long distance trips by transit (short hops are always driven), they don’t need Link’s 10-minute headways. Improve the HOV lanes for the express buses to Fed Way, and aim for eventual all-day hourly-ish Sounder service to Tacoma, and the billions for Link as well as the rationale for shortchanging the city on stop spacing disappears. 1) Tacoma is a city. 2) Pugetopolis is a single metropolitan area and needs to function like one; don’t treat a Seattle-Tacoma trip like you’re going to Portland. Frequent transit needs to go from every city and suburban downtown to all its neighbors. Maybe if ST makes the 594 and 574 run every 15 minutes instead of every 30 minutes, it could partly make up for no Link. 3) A lot of people live in Federal Way and Des Moines not because they want a house with a yard but because they can’t afford the apartment rents in Seattle. 4) Dublin and Bay Point have nothing to do with frequency to Berkeley. Frequency to Berkeley is low-ish (although it isn’t really) because of BART’s policy, not because the Dublin and Bay Point lines exist. The Berkely frequency was the same before Dublin as after Dublin. In fact, it’s better than it used to be in the 80s, when the trains ran every 20 minutes on evenings/Sunday instead of every 15 minutes. The Dublin line also filled a frequency gap between San Francisco and Bay Fair. A lot of people live in Federal Way and Des Moines not because they want a house with a yard but because they can’t afford the apartment rents in Seattle. To me, this suggests that housing density in the city isn’t nearly high enough. If housing is too expensive, that means that demand exceeds supply. So let’s fix that. I’m not. Trips of significant distance require a great deal of planning, which is why few are bothered by having to conform of Amtrak or airline schedules. Seattle and Tacoma are 31 miles apart. This is not a cross-town errand; it’s still a “trip.” You’re expecting to be gone for a while, and you’re not expecting to need to (or be able to) return on a moment’s notice, even in a car. So it requires not as much planning as the Portland trip, but it still requires some. Thus, it’s not such a big deal for a 30-minute or even 60-minute schedule to be a part of the planning process. 10-minute headways are for trips that can and should be able to be undertaken spontaneously. Bellevue qualifies; Tacoma doesn’t. I’m certainly in favor, as you seem to be, of gridding up the suburban service so that not every trip is an express from a transit center to downtown. But you can’t support 15-minute headways in all directions when you don’t have the density. (You wouldn’t even be able to justify 15-minute headways on every current Seattle route — the region’s core city is not even that dense, which is why route consolidation/simplification/gridding in Seattle are so important for frequency, transferability, and service-quality improvement.) The suburbs need cores and feeders, at whatever frequency is numerically supported, but expecting full penetration is foolhardy; it’s just not how they’re built! Yes, this is what I’ve been saying for years, and what Christopher Leinberger says in “The Option of Urbanism”, one of my favorite books. There’s an insufficient amount of housing in dense walkable neighborhoods with frequent transit, especially for people with families. That’s why the price is so high and many people without $60K jobs move to south King County. There they find an hourly bus if they’re lucky. We’ve had a nice buildup of dense housing in Seattle and in some suburban downtowns but it needs to be several times larger to saturate the demand and make it affordable. And it can’t all happen in Seattle because there’s not enough room and this is one metropolitan area. Pitting the city against the suburbs mean both lose, because people’s jobs and where they can live cross city boundaries. The suburbs need more transit and also pressure to be more transit-friendly. Another issue is getting to jobs in the suburbs. Most warehouse/industrial jobs are in Kent. Teachers and firefighters find that Seattle isn’t looking; the openings are in the suburbs. People with temp and short-term work (a big deal in this economy) have to go all over the metropolitan area. I can afford to live in a walkable part of Seattle and work in a bus-accessible part. My roommate can’t turn down jobs because they’re in Kent, although he tries to pick bus-accessible jobs in Seattle if he can. 1. Any estimates on what effect an extra station could have on schedule time? 2. How much difference would it make in ridership if the Route 8 went to five minute headways instead of fifteen? 3. In many other countries, public transit includes a whole “understory” of what we call “paratransit.” Used to be called “jitneys” here. In Turkey, word is “dolmush”, meaning “stuffed like a grape leaf”-good description of ridership. Idea is, cab service on a fixed route, like MLK. Large percentage of LINK ridership between Columbia City and Othello are probably familiar with this service from the old country. Regulate tightly for safety and service, make paperwork minimal, encourage cooperatives- might be one kind of “privatization” that could work. Russia has “marshrutnaya taksi” (fixed-route taxis), or vans which extend the reach of the Metro. These are not in the outskirts but in densely populated areas. If KC Metro finds these too expensive to implement in Rainier Valley (such as east-west on Othello, Graham, Edmunds, and Henderson), maybe a new company could start up to provide them? Although another companay could not rely on transfers (or ORCA readers), so they’d have to charge something. If they could make it on a dollar a ride, that would attract some people. These are called “dollar vans” in the outer boroughs of New York (also called “gypsy vans”). Known as mutatus in Kenya. In Bangkok, we have motorcycle taxis, ‘song-thaew’ shared taxis (pickup trucks with bench seating in the back) and van routes. The first is used to get in and out of subdivisions to the main road, the second ply the local and neighborhood streets feeding people to the main lines and town centers, the third usually run point-to-point via expressways, while some run along main streets. The fares are comparable to or higher (for vans) than public transit. These private transit enterprises started out as illegal, unregulated services, and were later legalized and regulated. The organized jitney thing was tried in Houston a few years ago…it never really worked out, at least in part due to heavy resistance from taxi companies. I find the potential liability and licensing issues frightening here, but I have used them in other countries with no problems other than maybe crowded vans. Right, liability is a big thing here. Enforcement is fairly lax. Those motorcycle taxis are supposed to provide helmets for passengers but very often people just ride without them. Vans have been involved in several accidents, a few with fatalities. Even public transit buses get into crazy accidents I would never see in the US (like a bus crossing over a median island and flipping on its side). I notice more and more transit agencies are adopting a ‘quiet car’ option to their rail operations. Sounder had one (must have been one of the first to try it), yet dropped it some time ago, I believe. Why would the concept succeed elsewhere but fail here? Or should it be considered again? Interesting. Safety is an option for questions 23 and 24 concerning the Light Rail; yet for question 22 safety is not an option for an answer about the bus. Ponderous.